Baguette-cut diamonds add a glam, retro appeal to any sparkler. Halo ring with cascading baguettes by Colin Cowie. Platinum semi-mount ring by Gumuchian. Emerald cut ring with tapered baguettes by Kwiat. Round cut ring with tapered baguettes by De Beers. 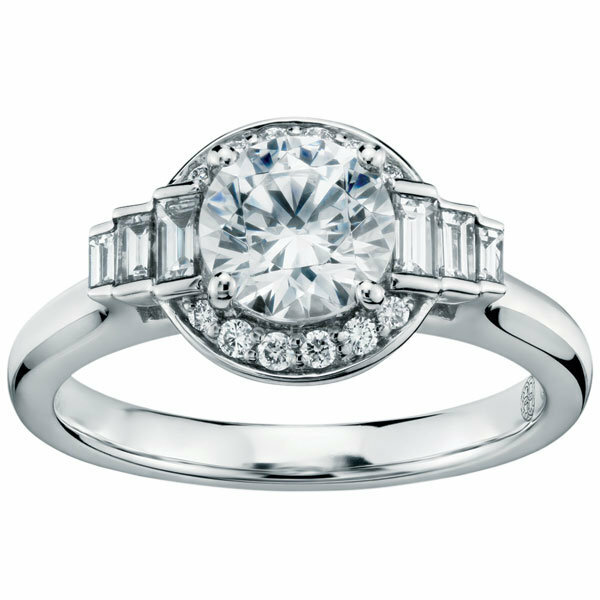 Halo ring set in 18k white gold by Forevermark by Maria Canale. Deco ring flanked by six cascading baguettes by Leo Ingwer. Platinum halo ring with baguette accents by Monique Lhuillier.